Ekornes Stressless E40 2 Seat with Longseat left- Enjoy White Glove Delivery at Unwind. This Ekornes Sectional features 2 seats plus a Longseat on the left facing side. This means your longest seat will be on the right hand when seated. The beauty of a longseat is that if you prefer to lie down, you down have to lay across the seats. Simply, scoot down to the longseat and drift off. The Stressless E40 is very popular as a sectional because it can provide numerous seats and still have a modest footprint in virtually any room. The 100% premium, top-grain leathers are our best-selling upholsteries. They are not your only choice. Ekornes has an extensive line of fabric upholsteries for all Stressless Sofas and Love Seats. Plenty of customer prefer one of the exquisite fabric upholsteries over the leather options. If this is the case for you, the options are nearly limitless. There are 15 different fabric grades and nearly 100 different colors. The Dinamica is the most exclusive and costs a little bit more than the other fabrics. It is usually equal in price to Batick Leather. 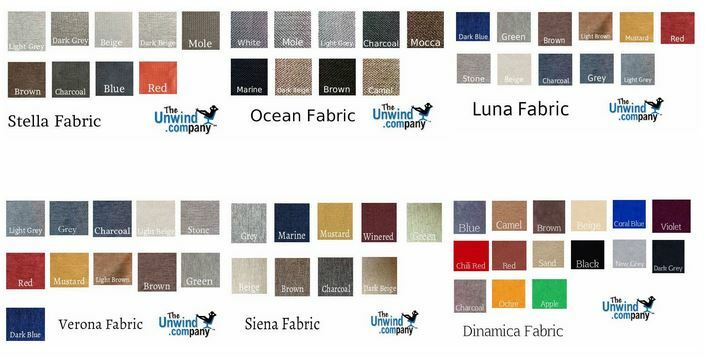 Check out our color palettes to the left to see some of the available colors in each fabric. If you would like to learn more details about each fabric individually, check out our Ekornes Fabric Page. or click the image to the left of our fabric grades and colors. You can also call 888-486-9463 to speak to our knowledgeable Customer Support Team Members. They are able to provide a more personalized description of each of these fabrics. Product Measurements: W: 93.25" H: 31.75" D: 72.75"
10 Year Warranty covers all internal mechanisms.